"I snapped. I absolutely snapped and I can't explain it any other way," said Chris Reichert of Victorian Village, in a Dispatch interview..."He's got every right to do what he did and some may say I did too, but what I did was shameful," Reichert said. "I haven't slept since that day." Obviously Rush Limbaugh, Glenn Beck or John Boehner aren't going to take responsibility for anything, regardless of how bad things might get, but it will be interesting to see if regular Tea Party activists start to come down from the high of "fighting tyranny" and, once it's clear that health care reform isn't going to lead to Armageddon or the end of freedom, are left with the sort of hangover Mr Reichert appears to be feeling. I heard somewhere that there is a Republican proposal to replace Ulysses S. Grant with Ronald Reagan on the American 50 dollar bill. This made me wonder: if you really wanted to piss off Civil War buffs and get rid of Grant, shouldn't you replace him with James Madison, who, after all, wrote the constitution? But apparently Madison already had a bill: the $5000 bill, which according to Wikipedia, when adjusted from 1929 dollars when it was still being printed, would be worth over $63,000 in 2010 dollars. There was even a $100,000 bill featuring Woodrow Wilson, worth over $1.6 million in today's dollars. I'm not completely clear on how the money supply actually works, but I don't imagine that even pre-computer, it was ever necessary to account for every dollar in bill form. I can't imagine what the point of printing bills that big was. In any case, I don't think the Reagan proposal is taken very seriously, but I do find the "culture war" angle of it to be interesting. Why replace Grant rather than, say, Hamilton on the $10 bill, or Jackson on the 20? You could even go after Franklin on the 100 who, like Hamilton but unlike Grant, wasn't even a president. The idea was to buy a toxic asset and create an interactive website that allows people to keep track of it, giving a sense for where we are in the financial crises in general. The stunning thing is that the $1000 they spent would have been more like 75,000 before the crises. Apparently Sarah Palin used to sneak her family across the Alaska-Yukon border to take advantage of Canada's health care system in Whitehorse. It must have taken some real courage considering all the death-panels and child killing socialists, but I definitely understand why she chose to take her family to Whitehorse. 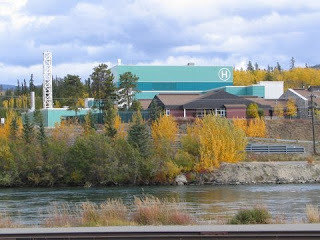 My own experience with health care in Whitehorse has been almost too good to believe. When working in the north last summer I got tendinitis. Considering how I was planning on returning south to study jazz piano in the fall, I took it fairly seriously. I went to the hospital, which seems like a newly built facility, and waited for maybe 15 minutes to see a doctor, who seemed generally happy to have a patient to treat. A year before, I accompanied April to the hospital and had pretty much the same experience. Having mostly lived in Montreal for the past few years, I'm under no illusion that the Canadian system has serious problems, particularly in Montreal where minimum wait-times, in my experience, were 3 hours, and where it's practically impossible to get a family doctor. Quebec, with a language barrier to attracting English speaking North American doctors, has special challenges, but similar problems are everywhere in Canada. Except in Whitehorse. The 33 thousand people living in the Yukon Territory have really gotten a great deal for themselves, though obviously you don't have to be there very late into the winter before seeing why it takes some extra incentives to get people to stay. Considering that the Whitehorse system was the one Palin had experience with, you can't help wondering how she was under the impression that single payer was really so bad. In Whitehorse, it's practically utopian. What's more likely: she wasn't. Conservative politics around US health reform has always seemed disingenuous. Palin is just not very good at hiding it.